Our Granddaughter, Kelsey were married last night to Todd Jarvis. What a joy!!! It was a beautiful wedding for a gorgeous bride and groom. I will be showing you more pictures this next week as soon as I can get them edited. I ordered this paper to try it out before stocking my shop with it. Oh my goodness it is so beautiful. I wish I could capture the shimmer and elegance. The black is accented with silver diamonds and then I used a silver border underneath it. 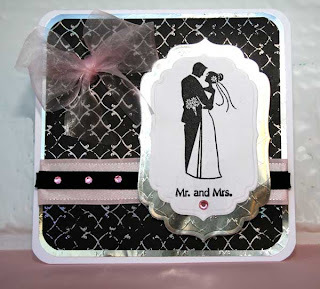 Using Labels 4 and the same silver paper, I made a border for the bride and groom. I wished I would have had some of Sharon's beautiful pink silk for the bow, but since I didn't I used a soft sheer ribbon by May Arts. Pink Satin was ran underneath the bride and groom and accented with black Velvet and pink rhinestones. Stamps--------------------Wedding by Inkadinkado (featured for this coming Monday's sale. Oh my gracious, she is indeed very lovely, a very handsome couple! Congratulations Joan, I know you're one proud grandma! Oops, that was me above Joan, I sent before I filled out my name . . .LOL! So glad you got to celebrate such a momentous event. Your family has been coping with so much. This was a ray of sunshine I'm certain. Your card is beautiful and the couple are as well. Some of the designers have given me boxes of scrap papers and items to use to teach my classes at the senior center because all supplies and my time is donated. So in order to have the classes, I often beg for "goodie boxes". In the last one I got, there were about 6 sheets of this silver paper. It IS wonderful and you cannot see what it looks like in your photo. But I can tell your readers it is exactly like a mirror. I hope you carry it because I didnt' have a clue where to find it. Congratulations to the happy couple and your card is beautiful. It is hard to make wedding cards, for me anyway, and this one sparkles. I love the addition of the pink. Just enough! Thanks for sharing it with us.